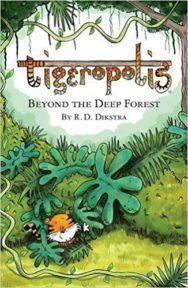 With the latest in the Tigeropolis series published in mid April, author R D Dikstra explains why he started writing the series and how he came to write about a family of vegetarian tigers living in the foothills of the Himalayas. I’ve been involved in conservation for years. I was inspired to write the series during a survey of what was happening in the buffer zones that surround India’s wild tiger reserves. Tiger reserves are vast – 400-500 sq kms or more. But the numbers of wild tigers are only a fraction (5%) of where they were 100 years ago. Tiger numbers have fallen from about 90,000 in 1900, to only about 3,600 now. Even if you are with experts, it’s often extremely difficult to see them in the wild. However, if you are lucky enough to see one, the experience is truly unforgettable. My first sighting happened after many days of fruitless searching and long after I’d resigned myself to it never happening. It was my last day. It had been a tiring, yet fascinating trip, as we journeyed from park to park, staying, for the most part, far off the beaten track, in old rest houses built to accommodate colonial era District Officers as they inspected the more remote areas of their patch. We were in Bandhavgarh – one of the more important tiger parks in India. It was already dusk. Just as we were about to leave the park, suddenly, out of the gloom we could just make out something moving in the undergrowth, two hundred metres away. We stopped and waited quietly in our little open-topped jeep. Slowly, the tiger slid out from its hiding place, briefly sniffed the air, then, cool as you like, walked towards our vehicle. It came within a few metres, looked at us for a moment, then ambled slowly past us on the verge of the dusty track. Twenty metres further on, it turned back, gave us a final glance as it moved towards some bushes and disappeared. It was only a couple of minutes, but you never forget that first sighting. Black and amber stripes, 200 kgs of muscle and pent-up power. Tigers are undoubtedly magnificent, iconic animals – hard to believe they are under threat. I knew instantly I wanted to write something about tigers. Yes, there are important issues to address, but I didn’t want something too serious, or ‘all doom and gloom’. I wanted to write something positive; something that would engage children, make them laugh, but also think a bit about the world around them. 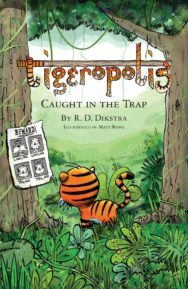 The Tigeropolis books have an important underlying message about conservation, but, above all, they are meant to be fun. In Tigeropolis the tigers end up running the show. They outwit bumbling officials, skilfully avoid a maharaja with a score to settle and even fight off a band of notorious poachers, all with the help of burrowing pygmy hogs, a troupe of bungee jumping monkeys, a herd of elephant powered water-cannon and a team of ‘stunt deer’, fresh from filming their latest Bollywood blockbuster. 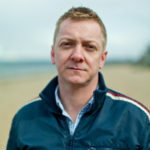 There’s more than a bit of slapstick humour in places, but much of what I write is based on real knowledge of what is happening ‘on the ground’. Tigers are not just worth saving in their own right, they are also an important ‘flag carrier’ for conservation. They are right at the top of the food chain. If we can help tiger numbers increase, then, almost by definition, a whole eco-system benefits. It’s one of the reasons organisations like WWF place so much emphasis on their Tx2 campaign to double the number of tigers in the wild by 2022, the next Chinese Year of the Tiger. So, given that tigers have such a key role it’s wonderful to know that tigers also have a special place in the hearts of children. They are simply fascinated with them. Almost without exception, in every school I visit, the children have seen a tiger. It might have been in a zoo, or in a wildlife park, but in each case the memory of their experience is clearly precious to them, and they are always keen to tell you all about it. I’m also really touched by the drawings of tigers I’m sometimes presented with quite spontaneously by a child. 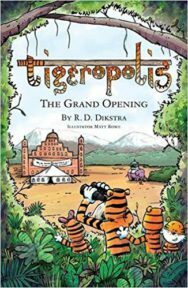 In my talks it’s great to be able to draw on all that enthusiasm, explain a bit more how tigers live, and then tell the story of how I came to write my Tigeropolis series about a family of vegetarian tigers running their own tiger park in the foothills of the Himalayas. I glad to say that the books have been well received leading figures involved in tiger conservation as they recognise that they offer a great way of getting children to think about the world around them. There’s also an audiobook narrated by Oscar-nominee Richard E Grant.